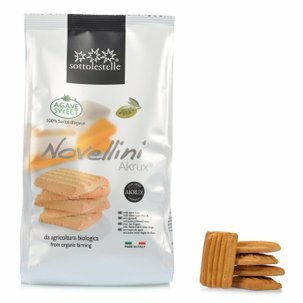 The Sottolestelle velette are thin crackers you can serve instead of bread, made with kamut wheat. This baked product with the delicate aroma of rosemary is meant for those who want to eliminate or reduce their intake of yeast: fragrant and crispy, mixed without yeast and only with extra virgin olive oil, they are a perfect combination of flavour and healthy living. Use them as an alternative to bread at meals, or use them to make a light and delicious aperitif or to prepare a crispy caprese millefoglie with tomatoes and mozzarella. Ingredients Khorasan Kamut flour 89%, extra virgin olive oil 80%, salt, rosemary 1%. ALLERGENS: Gluten, nuts, sesame, soya. For more information on product labels, please contact our Customer Service department. The information on the labels of the products may vary for reasons beyond our control, therefore, there may be discrepancies between the information on the site and that on the products delivered. Please always check the information on the product before consumption or use. Sottolestelle is a project designed to provide natural products made without the use of artificial additives and with the utmost care in assuring the genuine nature of the ingredients. 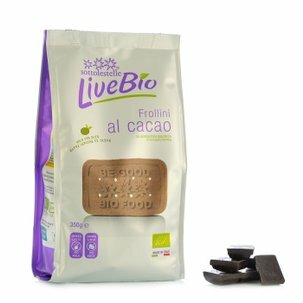 Part of the ingredients are actually sourced from the business's own farm, which produces almonds and cereals and also monitors the production chain of the olive oil employed. All the products are 100% organic and handcrafted using artisanal methods. Constant research and experimentation led to the decision to use exclusively pure organic essential oils in the production process. These measures also underpin theICEA certification (Italian environmental and ethical certification), awarded to Sottolestelle in recognition of the company's contributions in the sphere of environmental protection.